Chris Wood on the attack for Leeds United at Barnsley. 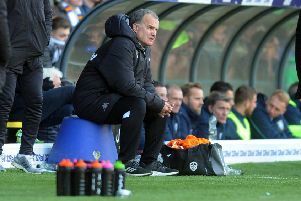 Three goals in nine minutes either side of half-time brought back bad memories of past visits to Oakwell for Leeds United as their impressive run came to a halt with a 3-2 defeat to Barnsley. United looked to be on course for another victory when Chris Wood netted his 18th goal of the season in the 18th minute and they led until just before half-time when it went wrong all of a sudden for Garry Monk’s men. They kept going to the finish and almost snatched a point at the finish, but were a pale shadow of the team that had been so impressive a week early against Derby. After an industrious opening lacking in goalmouth action with a couple of mis-hit crosses the only pieces of action to involve either goalkeeper Leeds took the lead from their first threatening attack on 18 minutes. Wood met Pablo Hernandez’s dipping corner to bundle the ball in from close range and United had scored yet another goal from a set piece - their sixth in their last six matches. More corners were forced as they got a grip on the game for a spell, but Barnsley survived the pressure with the closest to a goal being when Souleymane Doukara saw his shot beaten away by home keeper Adam Davies. Barnsley came into the game more towards the end of the half with Marley Watkins’ shot on the turn on the edge of the box being comfortably saved by Rob Green. Marc Roberts was then denied by Green after getting on the end of Ryan Kent’s angled free-kick into the box. Centre-back Roberts was also in the action in the 41st minute with another header from a Kent Free-kick that sent the ball wide. Leeds threatened at the other end as Kemar Roofe, previously anonymous, sent a great through ball for Wood to run on to, but keeper Davies was out well to block at the striker’s feet. But just when it looked like the visitors would see out the half ahead they conceded when they were caught napping at a free-kick playing down their left hand side and Tom Bradshaw headed home past Green’s despairing dive. The Tykes made it 2-1 within three minutes of the restart when Kent turned well in the box and fired a superb low angled shot into the far corner of the net. Worse was to come for Leeds six minutes later when Roofe conceded a free-kick on the edge of the area and from it Conor Hourihane fired past Green to make it 3-1. United were suddenly getting a chasing with Adam Armstrong and Hourihane hitting efforts over. They were handed a lifeline, however, when Wood chased a hopeful ball into the box and it bounced up and hit Roberts on the arm. Referee Mike Dean pointed to the spot and Wood duly fired home to get his side back in the game. Barnsley were still a threat as they showed when Hourihane hit a free-kick over while Hernandez saw a dangerous looking shot blocked at the other end and substitute Eunan O’Kane blasted the rebound well over. Leeds took the game to the hosts in the closing stages, but it was not their night as they knew when Roofe somehow put a volley wide at the far post from six yards out and Stuart Dallas was only inches wide with a spectacular volley in the final seconds. Leeds head coach Monk was frustrated with side’s display. He said: “I felt we were a little bit reactive today. We were slightly off what we normally are defensively. “I thought we deserved something from the game, but there are no excuses. “We got the goal and started to have control of the game, but the crucial factor was that we didn’t get the second goal, which we needed to. “They get the goal just before half-time and two just after. They were poor goals from our point of view to concede. “But we got that chance from Kemar near the end and could have got a point. “It’s a strange feeling for us to lose a game. I said there would be ups and downs and we have to make sure there’s more ups. Barnsley: Davies, Bree, Roberts, MacDonald, Jones, Watkins, Scowen, Hourihane, Kent, Armstrong (Williams 90+3), Bradshaw (Hammill 78). Leeds: Green, Coyle, Bartley, Ayling, Berardi, Bridcutt (Dallas 84), Vieira (O’Kane 58), Roofe, Hernandez, Doukara, Wood.